The first wine ever produced in our Lake Country series, this is what we regard as our “dock” wine. 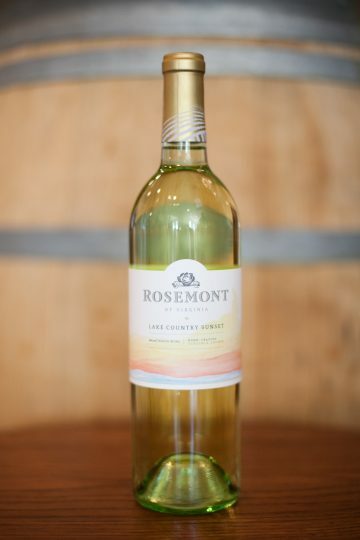 A blend of early and late harvest Vidal Blanc, this sweet white wine has aromas of pear, honeysuckle, and pineapple with undertones of citrus. Medium bodied with a complimentary sweet finish makes this wine perfect for the summer. I have never found a wine I like, but I love this one! I like desert wine like the vidal, but hands down this sunset is wonderful. Everything I like in one bottle! The best wine! I grab some every time I come through that area! I tried this over the summer and loved it. Now I wish I would have bought a case, cause I’m out and can’t get it in South Carolina. Awesome!!!! This is a very good wine. I never found a wine I really enjoyed until I tasted this wine. I tried it during the wine tasting last year and I purchased several several bottles, since then I ordered several more bottles.